Zucchini flowers are an extraordinarily delicate summer treat. 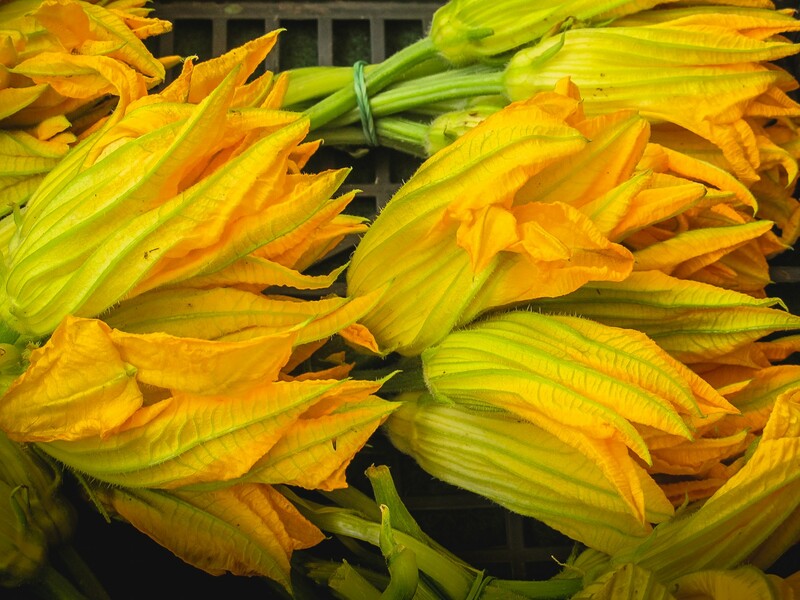 We find the male zucchini flowers for a very short period of the summer, so as soon they appear in the markets we are there to have them. They must be bought and eaten in the same day in order to best enjoy their unique fresh flavor. Zucchini blossoms are wonderful fried and delightful stuffed. They are great as antipasti or as party finger food. Provolone cheese OR Mortadella (bologna sausage) OR both, cut into 1cm cubs. Provolone can be replaced with any other piquant cheese. Trim the stems of the zucchini blossoms, remove the pistils, wash them gently and let them dry. In a bowl beat the egg and mix with the flour, salt and beer into a batter. Gently put one or two cubes of stuffing in each zucchini flower, closing carefully their corolla. One by one, put zucchini flowers in the batter. fry them until golden and drain them on absorbent paper. Steps 1-3 can be prepared in advanced, and zucchini flowers can be stored refrigerated up to one hour. Take out from refrigerator 10 min. before frying.